According to Guy Harper, Stan Pocock said they built the Husky Challenger in 1956 and it was then sent to Syracuse, NY as one of three shells to be stored at the NY Fairgrounds rather than be sent back to Seattle. It was used in the IRA yearly races for about three years....he was not sure when the boat was returned to Seattle. This Eastern storage was necessary as the UW crews started to fly back and forth rather than take the train that had previously transported the shells each year. 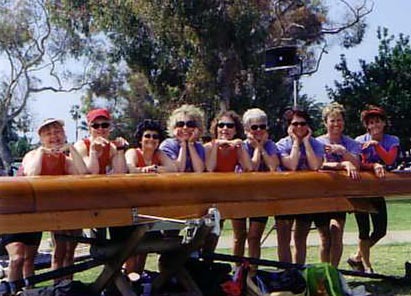 When the Challenger was returned to Washington it was used as a freshman boat for the UW and later as a novice boat for Lake Washington rowers. The boat has at least two chevrons on the bow (maybe three or four before it was refinished in 2002) so it must have won a couple of IRA races. We stored the Challenger at the Public House the first winter. It was good to keep her out of the weather but getting her in and out we think we cracked the hull in several places. In any case the next summer we muct have fixed 50 hull cracks. At first we would scrape, sand, epoxy, sand and revarnish - a time consuming process only to find six more splits the next row. Later we used a cyanoacrylate glue with a watery consistency and a spray accelerator. We could pour the glue in the crack even when the boat was wet, spray it with the accelerator, and row it again within minutes. But such repairs are no substitute for a new varnished in #104 glass finish like we eventually refinished the Hoh. 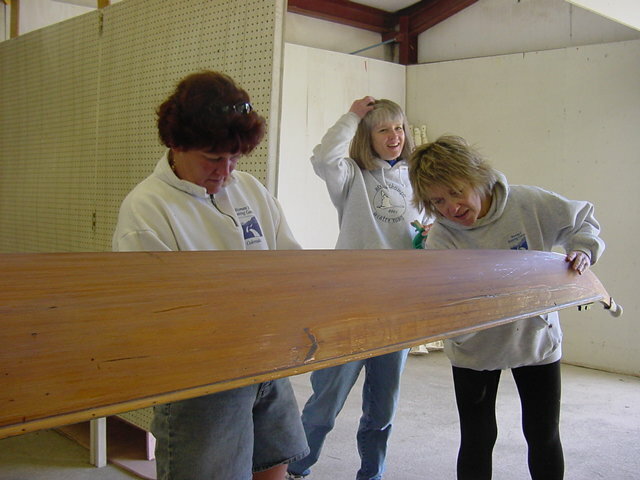 More pictures of restoring Husky Challenger off line at Rat Island Rowing. Nails take lead in restoration in 2011.